Movie buffs, this is the restaurant for you! Planet Hollywood Restaurant and Bar offers an extensive collection of Hollywood memorabilia. This planet-shaped restaurant is huge! Towering on the outside is a spinning globe with “Planet Hollywood” in bright red neon lights. By the entrance to the side, anchored down, sits the Shrimp Boat ‘Jenny’, used in the movie “Forrest Gump”. They have Father Merrin’s cross and purple scarf from “The Exorcist“, Madonna’s high school yearbook AND one of the original blue/white dresses Judy Garland wore in “The Wizard of Oz“. This place is loaded floor to ceiling with tons of stuff like that, everything from the rubber model of Christopher Lloyd that was run over with the steamroller in “Who Framed Roger Rabbit” to Terminator’s body cast. In addition, some vehicles used in blockbuster films like Herbie the Love Bug and the Terminator 2 motorbike are hanging by string wires from the ceiling. Scary but cool! I would recommend requesting a table on the 3rd floor, as it provides a great view of the entire restaurant. Since this place is literally shaped like a planet, it is split into three separate levels…the rounded off edge of the planet structure makes the inside truly a grand sight to see. It generally is super-busy here…partially because of its location at Downtown Disney, one of the most-visited tourist destinations in the world, but also because it’s so unique and everybody wants to see it. Reservations are recommended, especially for parties of 8 or more. I thought the food was decent, although a bit over-priced, but I have seen mixed reviews regarding the food quality. One of the most popular meals is the World Famous Chicken Crunch, which are tender strips of chicken with a crunchy-sweet coating, similar to that of ‘Captain Crunch’ cereal. Planet Hollywood is a fun place with plenty to see, including wall-to-wall memorabilia and a huge projection screen; a great atmosphere! 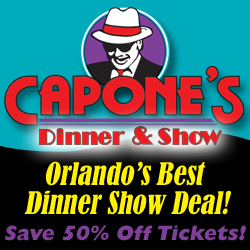 RESERVATIONS: For group reservations of 15 or more, contact their Sales Office at 407-827-7836.